Shadowing a public health midwife as she visited patients. 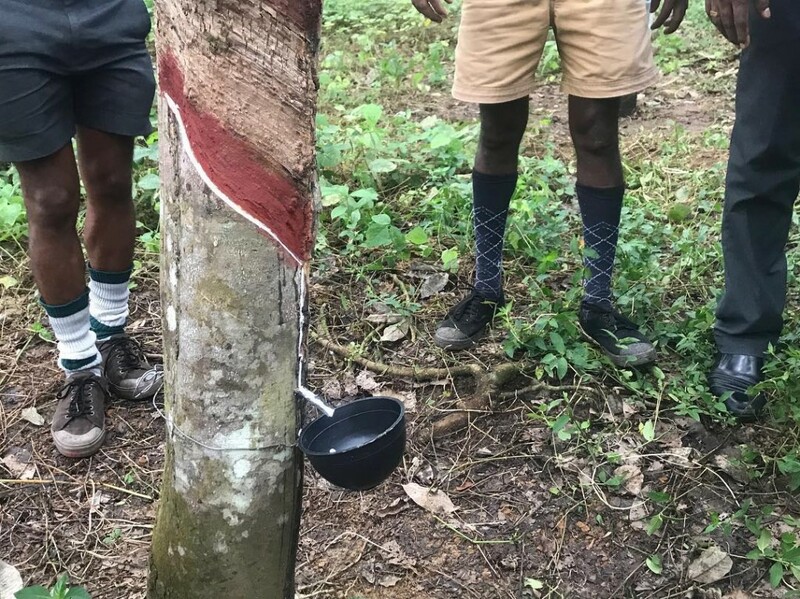 Seeing first-hand the occupational challenges and hazards workers at a rubber plantation face. Observing treatments and sampling blood-cleansing herbal tea at an Ayurvedic hospital. Learning about the connections between health and clean water at a water treatment facility. 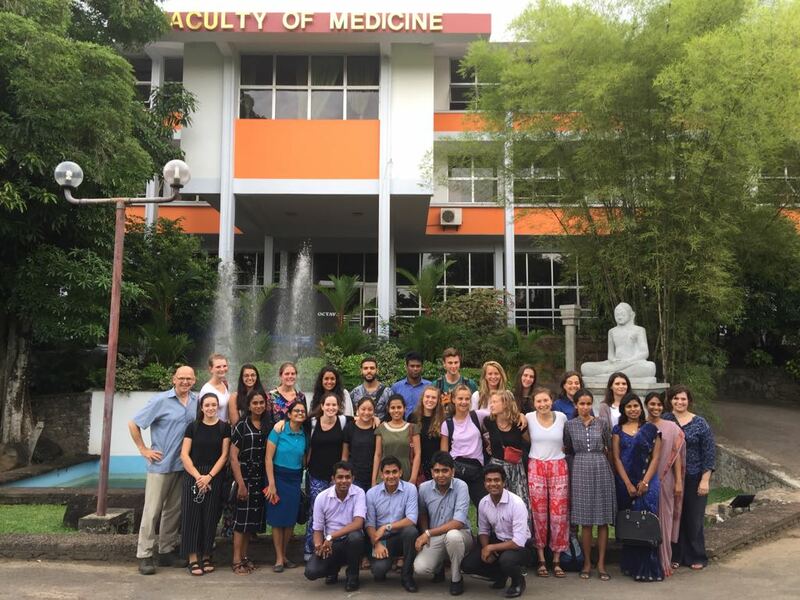 These biweekly excursions were among the highlights of the Duke Global Health Institute’s (DGHI’s) first study abroad course—“Global Health in Context: Sri Lanka”—launched in June in Galle, a town on the southwest coast of Sri Lanka. 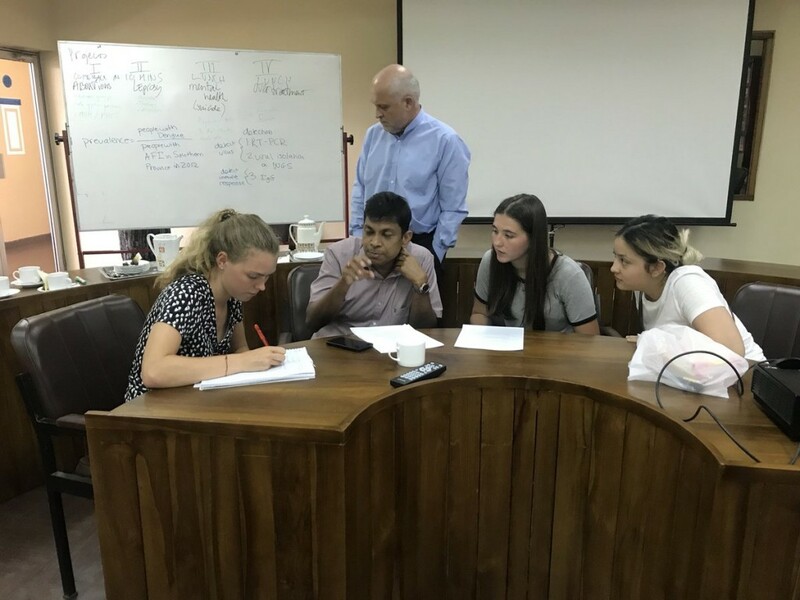 This new four-week academic experience was jointly created and delivered by faculty members at DGHI and two of our partner institutions: the University of Amsterdam/Amsterdam Institute for Global Health and Development and the University of Ruhuna in Galle. This three-continent collaboration makes the course unique among other global education offerings at Duke. It’s also one of few Duke study abroad courses in a middle-income country. “We really wanted to develop a global health course to be taught ‘on location’ in a country where the disease panorama is very different from that in North America, but where, in spite of severe resource limitations in general and in health services in particular, the population health status is surprisingly good,” said Truls Østbye, a professor of community and family medicine, nursing and global health at Duke and one of the three main course collaborators. Building international teamwork skills and an understanding of a very different culture were explicit aims of the course, and the collaboration helped students develop an appreciation of all three cultures, Østbye says. and Vijitha de Silva (University of Ruhuna) plan lessons. 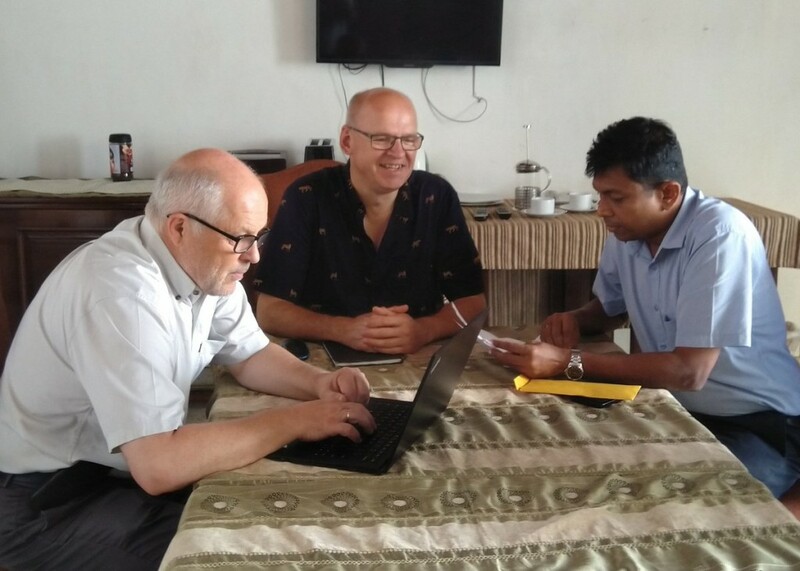 (From left) DGHI’s Truls Østbye, Guus ten Asbroek (University of Amsterdam) and Vijitha de Silva (University of Ruhuna) plan lessons. Participants included four Duke undergraduate students and 10 students from the Amsterdam Medical Centre at the University of Amsterdam. The course developers sought to create an interdisciplinary, multicultural experience that would broaden students’ perspective on health, health determinants and health care systems in low-resource settings. Through coursework, independent projects and field trips, the students delved into local challenges in four focus areas: maternal and child health, emerging infectious diseases, health of vulnerable workers and aging. Engaging in independent small-group projects—a cornerstone of the course—gave students an opportunity to delve into topics of both personal interest and local significance. Tackling challenging issues such as abortion, suicide, leprosy and antibiotic use, they identified and interviewed Sri Lankan experts, conducted research and presented their findings. DGHI’s Truls Østbye to plan their independent project on mental health. Sarah Philo MS’18, who joined the students for two weeks as a teaching assistant, was also impressed with the students’ initiative on their projects. “They were incredibly dedicated, and it was exciting for me to see them get so involved,” she said. The students’ responses were overwhelmingly positive, noting in course evaluations that the course was intellectually stimulating, they gained skills in working on multidisciplinary teams and their interest in global health increased as a result of participating in the course. Most notably, 86 percent of students said that they couldn’t have learned the same material at their home school. 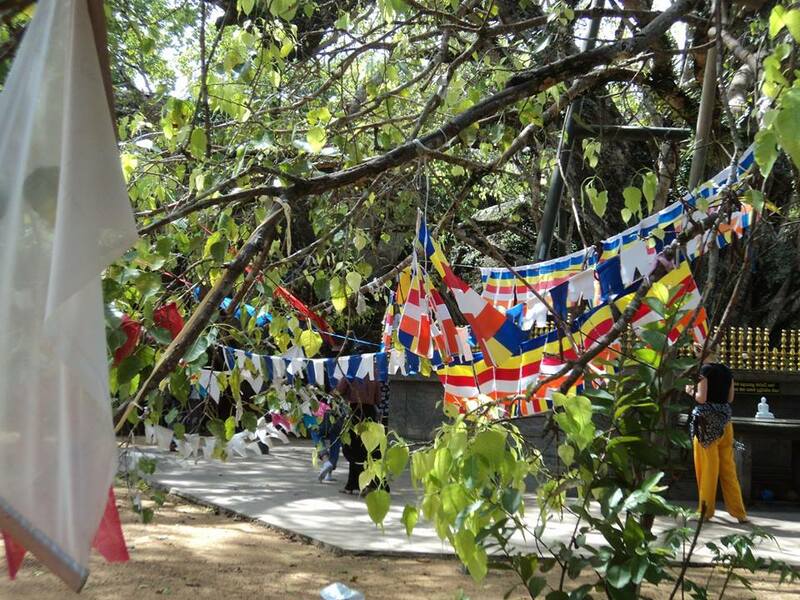 The interaction between students from different cultures and institutions is central the course. Next year, Østbye, ten Asbroek and de Silva hope to enroll ten students from each institution, providing an even richer multicultural experience for the participants. on the job because it is not mandated and can be uncomfortable. country where 70 percent of the population is Buddhist. 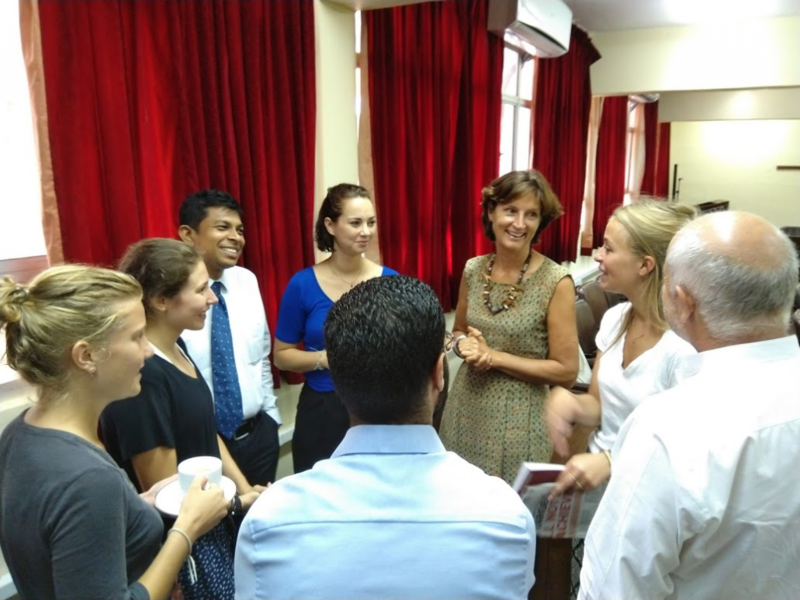 Sri Lanka, talks with students and faculty from the course. front of one of the University of Ruhuna buildings. Students sample herbal tea at an Ayurvedic hospital. The course really helped me gain a much deeper understanding of global health and the many reasons why it is an important field of study.